What promises to be the most sensational season yet of the controversial reality show Creature of the Night is about to premiere. The competition will be fierce and the challenges bloody because the twelve contestants are competing for more than a check and a bit of fame; they are competing for immortality. To earn it, they will vie for survival before an audience that lurks like a pack of fiends, ready to repay any sign of weakness with jeering applause. At the same time, they must impress a panel of vampire judges, the most approachable of whom is a nightmare out of history. But the real predators are the producers. While the audience looks forward to brutal good times, the contestants gear up to be their most outrageous, watchable selves. They have come to live, and to die. Their ranks include an intellectual desperate for more time, a vampire rights advocate on the verge of disillusionment, and a ballerina who thinks she has nothing to lose. Under scrutiny from the bickering vampires and bloodthirsty audience, the competitors must navigate potentially lethal challenges and, if they ever hope to become undead, stay alive. This book is a cross between THE HUNGER GAMES and Big Brother. 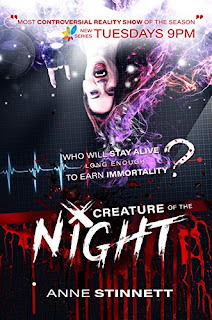 Welcome to Creature of the night where contestants literally play until the last one is standing . All to become a vampire. Twelve contestants will enter and only one will survive the onslaught of the audience that is out for blood and a panel of battling vampires Who will survive and will they love to be undead . The characters in this book are well developed. We have normal crazy to crazy crazy. They are diverse and all have their own reasons for wanting to become a vampire. I think the author could of made the characters just a little bit more complex . The best part of the whole show was the audience and their blood thirsty attitudes . They make the book fun .